*****The above photo is NOT the full painting. The owner of the painting at the time this photo was taken (Phyllis Robson) apparently only allowed the publisher (Hubbard book/frontispiece) to crop and reproduce Zardin. I have seen the original painting and the setting is a small cottage, bounded by a picket fence, with Zardin in the foreground and Afghan Lass in the background. Captain John Barff originally owned Zardin having imported him from India in 1907. Zardin won the Froeign Dog class at Crufts in 1908, 1910 and 1911. Classes for Afghan Hounds were not scheduled at Crufts until 1925. 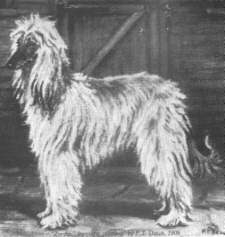 Zardin is important because he was the model for the early Afghan Hound Breed standard. It is reputed that Zardin was even presented to Queen Alexandra at Buckingham Palace. Later, Zardin moved on to a dealer, Shackleton, located in London's Leadenhall Market (the market/area still exists today). Zardin produced some children which apparently all died and netierh Zardin or his proginey appear in any Afghan Hound pedigrees anywhere in the world. The picture above was painted by 1909.